The new report by Zion Market Research on the “U.S. Education Market — Industry Analysis, Size, Share, Growth, Trends, and Forecast 2016–2026" has a vast information about the market and its potential. 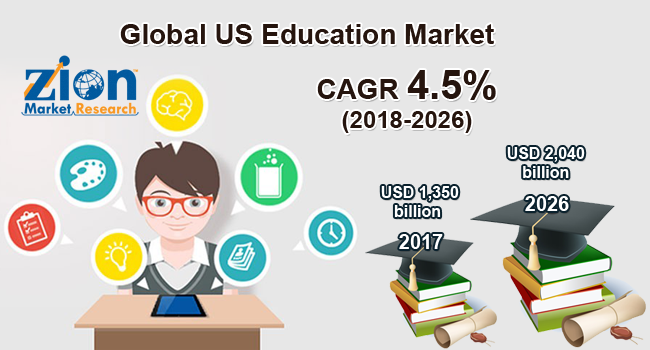 The U.S. education market was valued at around USD 1,350 billion in the year 2017 and it is expected to reach approximately USD 2,040 billion by 2026. The U.S. education market is expected to exhibit a CAGR of more than 4.5% between 2018 and 2026. Developments in the education system of the U.S. include growing popularity of the digital textbook, advancements in the educational content, and the growing interest in the e-learning. These advancements in the education system are triggering the growth of the market in the U.S. The other factors that are positively influencing the education market in the U.S. are growing secondary enrollment rates for different courses in the country and the increasing government spending on the education system. Our research analysts came up with the conclusion that there will be an increasing demand for the video-based educational content in the coming years. The growing technological advancements are reflecting in the education system of the U.S. The increased demand for the e-learning owing to its benefits is expected to increase the demand for the video-based educational content. Owing to the benefits of the video-based content such as better explanations within short time duration and consistency in the content is increasing its popularity. Based on the component, hardware segment accounted for the majority of the share in the U.S. education market. Hardware plays an important role in the education system. Both in the traditional educational system and in e-learning hardware components are essential. The growing trend of e-learning has increased the demand for the interactive displays. Interactive displays contributed the major share of 45% in the U.S. education market. The popularity of the interactive displays is increasing as it provides enhanced features when compared to interactive whiteboards. Broadly the end-users of the U.S. education market are higher education institute, K-12, and pre-K. The segment that dominated the U.S. education market is K-12. In 2017, this segment contributed the market share of 54.23%. The growing enrollments in the school and the increased focus on quality learning are propelling the growth of the K-12 segment.